Most of us have thought at one time or another that we’d like to use what we know now to go back in time and make different choices. Looking back at stock prices in 2009, it’s clear that a big bet on stocks in March would have paid off handsomely. As it turns out, stocks dropped further, but are now significantly above the level on that day. Suppose that I had borrowed $250,000 against my house to invest in the TSX Composite index, which was sitting at 9424.00 that day. The lows in March would have produced a painful paper loss of nearly 20%, but I’d be ahead 24.7% as of the closing value of 11,754.61 on Christmas Eve. Assuming that I paid about $10,000 in interest on the mortgage, my net gains right now would be $51,800. That’s not a bad payoff for minimal effort. But, I wasn’t really making a prediction, and I wouldn’t make a big bet like this with borrowed money. If I had collapsed this investment on 2009 March 9 when the TSX Composite was at 7566.94, my loss would have been about $52,300 (assuming interest costs of about $3000). The possibility of that kind of loss is enough to cure me of actually considering such a bet. This is the last regular Sunday feature looking back at selected articles from the early days of this blog before readership had ramped up. The pool of under-appreciated articles has been exhausted. Enjoy. The Dividend Guy challenged other bloggers to post their top 3 investing mistakes. Here is my contribution. Sadly, like most mutual funds, my funds underperformed the indexes despite the assurances from my financial advisors that I owned some of the best mutual funds available. Nearly a month ago I made an RRSP contribution and used the money to buy an index ETF. I then watched how it performed 10 minutes later, an hour later, a day later, etc. Even now I find myself more interested in how this ETF is performing than the rest of my portfolio. This happens every time I make a new investment or add to an existing one. Of course, this is all irrational, but I just couldn’t help being pleased that the ETF stayed above my purchase price during the first day. It shouldn’t make a difference to me whether I make $100 on this investment or some other one, but it does. I do my best to keep irrational emotions like this from affecting my decisions, but that doesn’t stop me from having the emotions. I assume I’m not alone in this need for new investments to perform well. Do other investors find themselves caring more about recent purchases than the rest of their portfolios? This blog has featured many attempts to explain the damage that investing fees, primarily MERs on mutual funds and ETFs, can have on your savings. This latest effort uses a picture. 1. The money follows the S&P 500 with dividends. We track real returns, meaning that the effect of inflation is factored out. 2. The money follows the S&P 500 with dividends less MER fees of 0.17% per year. This is the MER level of the widely-popular iShares large capitalization index of Canadian stocks (XIU). 3. The money follows the S&P 500 with dividends less MER fees of 2.5% per year. This is the MER level of a typical Canadian stock mutual fund. 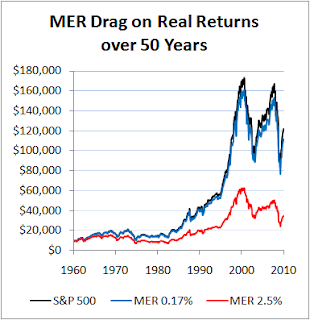 As the chart shows, a 0.17% MER ETF tracks its index fairly closely, even over 50 years. 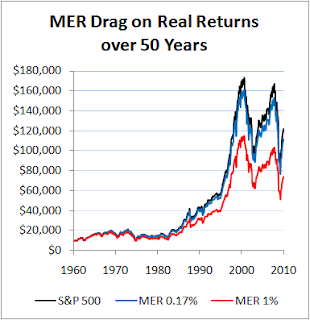 However, the 2.5% MER has decimated returns. The final portfolio value is less than one-third of the value for the lower MER. Although a percentage like 2.5% sounds like a small figure, it gets deducted from the same portfolio year are year and eventually adds up. Like the flow of water slowly carving a groove in rock, MER costs slowly carve away a big chunk of your savings. As we can see, the 1% MER took quite a bite. The final portfolio value is more than 1/3 less than in the 0.17% MER case. Even fractions of a percentage point matter over an investing lifetime. Recently we discussed a modified 4% rule where we base the size of monthly withdrawals from retirement savings on the current portfolio size rather than the portfolio size at the beginning of retirement. 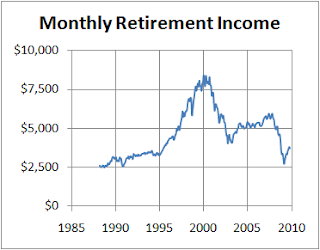 Let’s follow this up by looking at actual market data to see how monthly retirement income is affected. Because US data is more readily available, I’ve gathered returns on the S&P 500 (including dividends) since 1988, adjusted for inflation. Let’s consider the case of Rita who retired in 1988 with a portfolio worth $750,000 in today’s dollars. The actual figure in 1988 was a little over $400,000. Rita has 100% of her money in the S&P 500 index. This is obviously a more aggressive portfolio than most retirees would want, but let’s see what happens to Rita’s income. Rita had only one month where her inflation-adjusted income dipped below $2500 to $2479. By the year 2000, the buying power of her income had tripled. However, this was followed by one big drop from 2001 to 2003, and then another big drop in early 2009 where it reached $2711. It seems that Rita fared rather well over the years considering that her income started at $2500 per month. However, if her lifestyle had expanded to consume her income when it was over $7500, she may have found the subsequent drop painful. Things would have been far different for Ray who retired in 2001. Just two years later his retirement income was chopped in half. This may seem to be an argument against modifying the 4% rule, but if Ray had stuck to making monthly withdrawals based on his 2001 portfolio size, he would run out of money fast. Ray’s situation isn’t so much an indictment of the modified 4% rule as it makes it clear that a portfolio 100% in stocks is risky. One thing that this experiment has left out is that it makes sense for retirees to increase the percentage of their portfolio that they spend as they get older. If Rita turned 65 in 1988, then she is 96 now with a portfolio worth over $1.1 million as of the end of October. She can probably afford to spend more than 4% each year now. How much more is an interesting question. I got my flu shot Thursday. Actually, I got two shots: one for the H1N1 (swine) flu and the other for the “regular” seasonal flu. I only planned on getting the swine flu shot, but the young man I first encountered was a good salesman. The whole process took 25 minutes, including filling out a form, standing in line briefly, getting the shots, and waiting the mandatory 15 minutes to make sure I didn’t have some sort of reaction. Apparently, the long lines have dwindled and the bracelet system isn’t needed any more in my community. So far the shots hurt less than the standard tetanus booster. 1. Kathryn at Million Dollar Journey looks at the ethics of lottery tickets and gets a flood of comments. 2. Who knew there were so many ways to calculate the return on a portfolio? 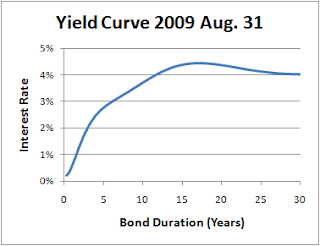 Preet answers a reader question about the Modified Dietz return calculation. 3. According to Larry MacDonald, parents in need can sue their adult children for support if they supported their children financially when they were minors. 4. Ellen Roseman helped some people who made an online purchase, but were charged more on their credit cards than was indicated in the online checkout form. 5. Canadian Financial DIY shows how ETF investors can do some tax loss selling while maintaining their asset allocations. 6. The Tax Guy looks at who gets the contents of a joint bank account when one of the account holders dies. 7. Big Cajun Man thinks that the TD Bank is daring him to find another lender with lower interest rates. 8. Canadian Capitalist illustrates the risk of choosing the wrong mutual fund. 9. Do charities spend too much on administration? Thicken My Wallet looks at this oft-given reason for not contributing to charity. Just when it seemed that the fixed rate natural gas marketers had stopped coming to my door, hot water tank marketers started ringing my doorbell. So far I’ve had two of these guys show up, both pretending to work for my natural gas supplier, but they don’t. So, why would I turn down a free hot water tank? After all, my tank is more than 5 years old and may not have peak efficiency (according to one salesperson). I’ll save money because of the lower gas consumption. What these guys failed to mention is that they don’t work for a company that I already have a relationship with, the rental charges on the new tank will be higher than I’m paying now, and I would have to lock in this rental charge rate for many years (15 years according to some reports). Based on the rental charge I extracted from one salesperson and a quote from Sears for a new hot water heater, I could buy a new tank for less than three years worth of rental charges. So, when I decide the time is right to dump my old tank, I’ll be buying a new tank and dumping the rental charges. Many investors seem unaware of the fees they pay to own their mutual funds. Disclosure rules are intended to prevent this sort of problem, but they don’t seem to be effective enough.